With over 60 percent of the population of Rwanda under age 30, the country’s young people have the potential to transform its development and economic growth—if they can find meaningful jobs. 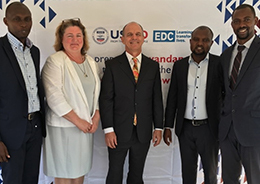 To increase youth employability, EDC joined with more than 200 government and business leaders to launch Huguka Dukore, a work readiness and internship program. 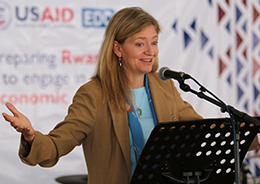 The five-year, $20.5 million initiative funded by the U.S. Agency for International Development aims to reach 40,000 of Rwanda’s most vulnerable young people. Many young Rwandans ages 16–30 have had limited basic education and earn less than $1.75 per day. Huguka Dukore, which means “get trained, let’s work” in Kinyarwanda, will provide young people with job skills training, work-based learning and internship opportunities, and links to jobs and self-employment. Ceremonies to launch Huguka Dukore were held June 13 in Kigali. Speakers included Rwandan Minister of Technical and Vocational Education and Training Olivier Rwamukwaya, EDC Senior Vice President Siobhan Murphy, and U.S. Ambassador Erica Barks-Ruggles. The program, which will continue through 2020, builds on the successful EDC-led Akazi Kanoze Youth Livelihoods Project, which began in 2009 and provided job skills training for more than 21,000 Rwandan youth. That work has expanded with support from the Government of Rwanda, The MasterCard Foundation, Department for International Development, and others. EDC will lead the new work with Catholic Relief Services, Connexus Corporation, Souktel, TakingITGlobal, and Akazi Kanoze Access as partners.